CHARLESTON-BASED artist Kevin LePrince presents a solo show this month at Reinert LePrince Fne Art, a gallery and studio he co-owns with fellow local artist Rick Reinert. The show, titled Local Color, opens on March 8 with a reception from 5 to 7 p.m. and runs through March 29. LePrince graduated from the University of South Carolina in 1992 with a degree in economics, then spent the next 12 years in the securities brokerage industry. But in 2004, he left his position as a vice president with a major firm to pursue a career as a professional artist. "[Art is] something that has always been in my blood, it just away from me a while," LePrince says. The primarily self-taught artist paints alla prima using thick, broken brush strokes and a limited but vibrant palette. "the paintings I like most have a shorter brush stroke that leaves part of the scene unpainted, "LePrince says. "that was there's something left unsaid, so the viewer can bring their own interpretation to the piece." The month's show features 15 to 20 new works in oil. "What I really wanted to do for this show is focus on color," LePrince says. Recently, the artist spent a period of time painting in black and white. 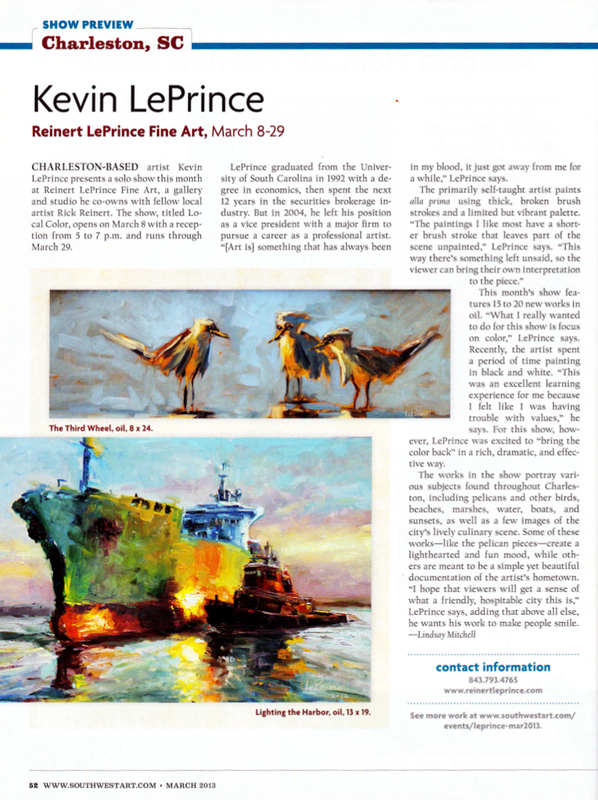 "This was an excellant learning experience for me because I felt like I was having trouble with values," however, LePrince was excited to "bring the color back" in a rich, dramatic, and effective way.